Visitors to Nigeria are often tempted to explore the attractions of other countries in West Africa, including nearby Cameroon to the east, the Benin Republic to the west, and Niger to the north. The southern border of Nigeria is made up of 563 km / 350 miles of coastline, meaning that you can plan endless excursions if time permits. 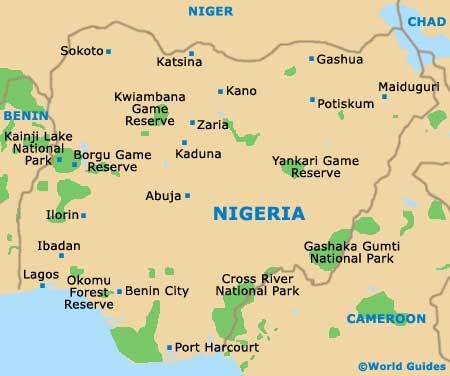 Bordering the north-easterly tip of Nigeria and directly east of Niger is the country of Chad, which is far from being a popular tourist destination. However, that said, Chad does boast some magnificent landscapes, natural attractions, extinct volcanoes and deep valleys, where ancient cave art can be admired. There are plenty of good reasons to head over the western border and into nearby Benin. Beautiful beaches, cultural and historic attractions, mountains that are perfect for hikers, and wildlife in abundance are just a few. The capital city of Benin, Porto-Novo, is worth a visit, as is Benin's other major city, Cotonou. Just north of Cotonou is Ganvie, a village that's built on stilts over a lake, and Ouidah, an ancient slave port. For relics of the Dahomey Kingdom, head to Abomey and visit the Musee Historique d'Abomey, before admiring Ghezo's throne, which is actually mounted on human skulls. The capital city, Niamey, is the cultural and administrative hub of Niger, north of Nigeria. Tourist attractions include the city's Grand Marché, the Artisans Village, Niger's National Museum and the city's zoo. Wildlife lovers can head to the W National Park, which actually spreads over Niger, Benin and nearby Burkino Faso. Recommended are trips into the Tenere Desert (part of the Sahara) and outings to the mystical Air Mountains, as well as excursions to see the mud mosque of Agadez. For a taster of African wildlife, head to see the wild herd of giraffes at Koure. Whilst many travellers simply pass through Chad, the capital, N'Djamena, may well appeal, with its busy Central Market (Marché Central) and Chad National Museum (Musee National Tchadien). Further attractions in Chad include the market town of Bol, the village of Gaoui, the Zakouma National Park and the Ennedi Plateau, where the awesome desert rock formations deserve to be seen in the flesh and then perhaps photographed. Located to the east of Nigeria, Cameroon isn't often thought of as a tourist destination, which is a shame, because the country boasts a rich geography that has earned it something of a reputation as 'Africa in miniature'. 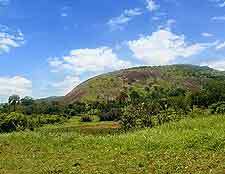 Within Cameroon's boundaries, it's possible to see pretty much every environment that you'd expect to find in Africa, from rolling grassland to dense rainforest and even the heights of Mount Cameroon. Cities worth visiting include the capital Yaoundé, and the economic hub of Cameroon, Douala. Of the two, Yaoundé is by far the most picturesque, set amidst pleasant green hills and enjoying a pace of life that's less frenetic than Douala.